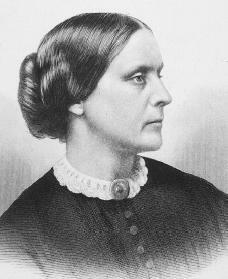 Susan B. Anthony was an early leader of the American women's suffrage (right to vote) movement and a pioneer in the struggle to gain equality for women. As an active abolitionist, or opponent of slavery, she campaigned for the freedom of slaves. Susan Brownwell Anthony was born on February 15, 1820, in Adams, Massachusetts. She was the second of seven children born to Daniel and Lucy Read Anthony. Her father, the owner of a cotton mill, was a religious man who taught his children to show their love for God by working to help other people. Susan began attending a boarding school in Philadelphia, Pennsylvania, in 1837. She left and began working as a teacher after growing debt forced her father to sell his business and move the family to a farm near Rochester, New York. Anthony continued teaching to help her family pay the bills until 1849, when her father asked her to come home to run the family farm so that he could spend more time trying to develop an insurance business. Many famous reformers, such as Frederick Douglass (1817–1895), William Lloyd Garrison (1805–1879), and Wendell Phillips (1811–1884), came to visit Anthony's father during this time. Hearing their discussions helped Susan form her strong views on slavery, women's rights, and temperance (the avoidance of alcohol). Anthony did not take up the cause until 1851. Until that time, she had devoted most of her time to the temperance movement. However, when male members of the movement refused to let her speak at rallies simply because she was a woman, she realized that women had to win the right to speak in public and to vote before they could accomplish anything else. Her lifelong friendship and partnership with Elizabeth Cady Stanton (1815–1902), who had proposed a resolution giving women the right to vote, also began in 1851. Anthony attended her first women's rights convention in 1852. From that first convention until the end of the Civil War (1861–65), she campaigned from door-to-door, in legislatures, and in meetings for the two causes of women's rights and the abolition of slavery. The passage of the New York State Married Woman's Property and Guardianship Law in 1860, which gave married women in New York greater property rights, was her first major legislative victory. The Civil War was fought between northern and southern states mainly over the issues of slavery and the South's decision to leave the Union to form an independent nation. With the outbreak of the Civil War, Anthony focused her attention on ending slavery. She organized the Women's National Loyal League, which gathered petitions to force passage of the Thirteenth Amendment to the Constitution to end slavery. When the war ended, she increased her efforts to gain the right to vote for women as well as for African American males. However, her former male allies from the antislavery movement were unwilling to help her fight for the first cause, saying the time was not yet right for women's suffrage. Saddened by this defeat but refusing to give up the fight, Anthony worked solely for women's suffrage from this time to the end of her life, organizing the National Woman Suffrage Association with Stanton. The association's New York weekly, The Revolution, was created in 1868 to promote women's causes. After it went bankrupt in 1870, Anthony traveled across the country for six years giving lectures to raise money to pay the newspaper's ten-thousand-dollar debt. In 1872 Susan B. Anthony and fifteen supporters from Rochester became the first women ever to vote in a presidential election. That they were promptly arrested for their boldness did not bother Anthony. She was eager to test women's legal right to vote under the Fourteenth Amendment by taking the case to the U.S. Supreme Court. Free on bail of one thousand dollars, Anthony campaigned throughout the country with a carefully prepared legal argument: "Is It a Crime for a U.S. Citizen to Vote?" She lost her case in 1873 in Rochester following some questionable rulings by the judge and was barred from appealing the result to the Supreme Court. Susan B. Anthony spent the rest of her life working for the federal suffrage amendment—an exhausting job that took her not only to Congress but to political conventions, labor meetings, and lecture halls in every part of the country. After she noticed that most historical literature failed to mention any women, in 1877 she and her supporters sat down to begin writing the monumental and invaluable History of Woman Suffrage in five volumes. She later worked with her biographer, Ida Husted Harper, on two of the three volumes of The Life and Work of Susan B. Anthony. The material was drawn mainly from the scrapbooks she had kept throughout most of her life, which are now in the Library of Congress, and from her diaries and letters. Anthony remained active in the struggle for women's suffrage until the end of her life. She attended her last suffrage convention just one month before her death. She closed her last public speech with the words, "Failure is impossible." When she died in her Rochester home on March 13, 1906, only four states had granted women the right to vote. Fourteen years later the Nineteenth Amendment, which gave women the right to vote, was added to the U.S. Constitution. Barry, Kathleen. Susan B. Anthony: A Biography of a Singular Feminist. New York: New York University Press, 1988. Harper, Judith E. Susan B. Anthony: A Biographical Companion. Santa Barbara, CA: ABCCLIO, 1998. Sherr, Lynn. Failure Is Impossible: Susan B. Anthony in Her Own Words. New York: Times Books, 1995. LOOK AT THIS IS IT COOL OR NOT SEND BACK PLEZZZ YOU CRAZY I LOVE PANDAS NOT YOU!!! This is a great website. It really did help with my research, thanks so much! this really helped get information on this person.